The Book Rat: A Very Austen Instagram Challenge! I’ve dabbled with a good ole’ instagram challenge before (and even succeeded at it, a time or two), but though I’ve always intended to, I’ve never mustered up the go-gettiveness to put together a daily insta challenge to coordinate with Austen in August. Fortunately for me, Faith Hope Cherrytea has got it covered! This instagram challenge was originally created last year to go along with a certain similarly-named Austen fest hosted by Roof Beam Reader, and this year, it is making its way over to us! To participate, use the prompts below to post daily Austen-inspired pics & mini-chats (if you want) on instagram. 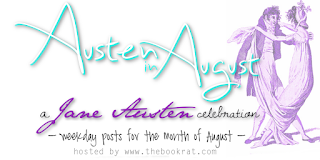 Make sure to use the hashtag #AustenInAugust so other AIA readers can discover and interact with your posts! Though I make no promises to succeed at posting daily for this particular challenge (I mean… I am a literal crazy person during Austen in August, so I make no promises about anything, ever), I will certainly do my best. But I WILL be keeping an eye on the hashtag, and let's just say, I have a little something cooked up as a special, unlisted giveaway, which will be randomly selected from those who post! 4- Silver Screen – any 5* JA movie recs? 9- Party Time! – Anne Elliot’s 231st Birthday! 29- News – what’s new in the world of JA ? See you on insta, Janeites! Haha! Same here. I mean well with the Instagram bookish challenges, but fall off the wagon at some point and sometimes get back on. I'm in for as much as I can though next week is camping and away from wifi so will have to miss or catch up those ones. It should be fun. Oh dear I failed. Late to this insta party. I’ll try to catch up and do a few just to be a joiner, hahah.